As the new year begins, the future of food services at Trent University is on our minds at Sustainable Trent. After almost 15 years with Aramark as the exclusive provider for the vast majority of our campus, we feel that the time is ripe for fundamental change. Trent has the potential to be a leader in sustainable, innovative, and affordable food services. Unfortunately, we have continued to earn a failing grade. Students living on residence are still locked into costly meal plan contracts with Aramark, unable to spend flex dollars at the Seasoned Spoon, the Ceilie, or the Planet. The food remains high in cost and low in quality, and fails to meet the diverse dietary and cultural needs of Trent students. That is why Sustainable Trent began hosting large free meals to Boycott Aramark starting in February 2013. So far, we have provided five dinners located in four Colleges to hundreds of students. These meals do not constitute a true consumer or economic boycott since students on residence have no choice but to purchase Aramark food, but that is exactly the point. The purpose of these feasts is to simultaneously protest the monopoly that Aramark—a multinational corporation—enjoys over the food services provided on our campus, and to showcase the diverse possibility of solutions to the current unsustainable food system. These solutions include seasonal and locally grown food, grass-fed meat, and gluten-free, vegan, and vegetarian options. Free, healthy, and abundant food, catered by Food Not Bombs and Dan Legault, has also been successful at bringing students together to celebrate good food and great company. For students living on residence, these meals have provided a much-needed break from Aramark’s costly, limited, and processed food options. They have brought together a community of people who are passionate about having a voice in choosing the food we eat and how our food services are run. Trent has a long history of student-led activism for food justice. From the creation of the Seasoned Spoon co-operative, to Fair Trade Trent, to the Trent Vegetable Gardens, we are creating the solutions to an unsustainable food system right here on campus. Trent students have held protest potlucks in the past against Aramark’s corporate monopoly. Now that Aramark’s contract is ending, we are clamouring for substantial and ongoing improvements to our campus food system. Here we are in 2014, and change is in the air. We are hopeful that significant changes are in store for food services at Trent, and we find the direction that the Food Services Review Committee has taken to be encouraging. While we do not yet know which bidders are currently being considered by the committee, we sincerely hope that they choose the provider that is most willing to implement the changes that students are calling for (as laid out in the TSCA’s Raw Deal and OPIRG Food Policy recommendations), and to allow for ongoing, democratic student participation in decisions concerning our campus food services. Some important small steps have been taken, such as the incorporation of five of the 12 recommendations in the Raw Deal document into the one-year contract extension with Aramark. Given the overwhelming support from students for these recommendations, we think that all 12 should be required from the next food service provider. Recommendation #1; Increase the number of autonomous food service outlets on campus excluded from primary food contract, and #2; put more “flex” in “flex dollars” by allowing students to use flex dollars at a diversity of food service outlets across campus and in Peterborough, are of particular importance in breaking the current corporate monopoly. The OPIRG Food Policy recommendation that 10 percent of food should be certified organic, local, and sustainable, with this percentage increasing by two percent each year, would be a great start in ensuring that our food services fit into the new sustainable and just food paradigm that we need to realize here at Trent. We should not be allowing multinational corporations such as Aramark, Chartwells, and Sodexo to profit from students who need to eat on campus while they attend university. These companies, while they have a lot of capital, are not able to meet our local needs for a sustainable, just, and healthy food supply. It is our opinion that Trent should pursue self-operated, in-house services, meaning that the University would own the cooking equipment, hire the staff, and manage each of the cafeterias. The recent Food Systems Consulting report commissioned by the University asserts that self-operated services are not feasible at this point in time, and that preparations could take years in order to develop a management team capable of doing the job. We recognize that this will take time, but we call on the University to take swift action to begin preparations for in-house food services so that we are ready by the time the next contract ends. 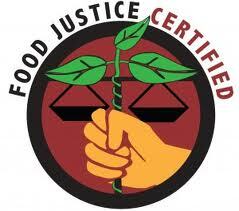 Food should be for the people by the people, not for the benefit of massive companies! To represent the fact that we are both against Aramark and the corporate food monopoly, and for a just and sustainable food system, we have expanded the name of our next free meal to be Boycott Aramark: A Feast for Food Justice! Join us on January 24 for the next feast. Details of the event location and timing are TBA. Look out for the Facebook event (like “Sustainable Trent”) and the posters. Come with your hunger for change and your thirst for justice!